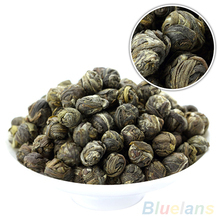 The most popular of all scented teas, Pearl jasmine are created by rolling specially plucked long downy shoots into little silvery â€œpearlsâ€ which are naturally scented multiple times with fresh, aromatic jasmine flowers. 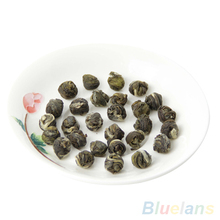 Pearl jasmine tea is named after the pearl like shape of the tea. Each small pearl is hand rolled. The tea is made by laying fresh jasmine petals atop the tea leaves, then tea leaves atop more petals, and so on. 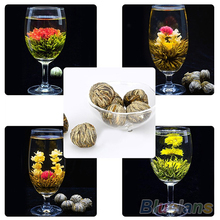 Up to six layers of blossoms alternating with tea leaves are used to create the highest- quality jasmines, using flowers picked at their aromatic peak. 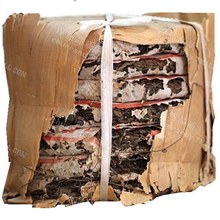 When the jasmine scent is fully merged with the leaves, the petals are removed, and the tea carefully dried again. Each pearl blosoms when added to water. 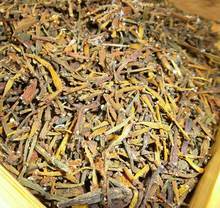 This stunning tea has an intense flavour and the beautiful aroma of jasmine. Jasmine tea is like champagne. It goes with almost everything, stands alone, and makes both a perfect hostess gift and a fabulous iced tea drink. 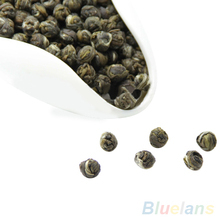 Note that jasmine “pearls” are individual tea leaves are rolled by hand into tiny balls – each its own little world of flavor. Watch the pearls blossom before your eyes. Different from common pearls made with bud and stem system, our specialy made pearl is made with robust spring leaves only. 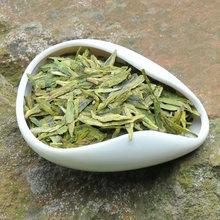 The result is that it absorbs more jasmine aroma during process and the flavour is much stronger. You can make more infusions out of it as well. Our promotion pack includes 100 grams (3.5 oz), free shipping. 1. Place enough pearls to cover the bottom of the cup with a single layer. 2. Start heating about 2 to 3 cups of cold, filtered water until you get Shrimp Eyes (140-160F). When these tiny bubbles cover the bottom of the pan, pour the water into the guywan. 3. Cover and wait about a minute until the pearls begin to open, then watch as they settle, stroking the liquid occasionally with the lid. 4. In 2 to 3 minutes your first sip is ready.